It’s been quite some time since I last updated this blog. Reason is simply because I have covered most of the basic stuffs you have to know about selfie stick. In fact, this article, “how to use a selfie stick – the complete guide” is pretty popular, having close to 100 comments as of writing this post. Today I will be covering the best GoPro Selfie Sticks in 2016. So why am I writing this post today? Well, I have been searching lately for GoPro selfie sticks and can’t seem to find articles recommending adequate products. They tend to recommend readers (you) to normal selfie sticks instead of GoPro selfie sticks. What’s the difference between GoPro and normal selfie sticks? Generally speaking, GoPro sticks are used to complement GoPro Cameras (action cameras) which are often used in extreme conditions. For example, you can be recording a video while you are skiing down the icy mountain or taking pictures while you are snorkeling. Due to the fact that GoPro selfie sticks are to be used in such conditions, you can’t possible purchase just any kind of selfie sticks out there (or follow any general advise in choosing selfie sticks). Here are some deeper analysis of the differences between GoPro and normal ones. GoPros have to be much stronger. Should be rugged and completely waterproof. You have to purchase an extra GoPro Bluetooth remote (and they can be expensive, around $50) as most GoPro selfie sticks don’t come together with them. Plus, you can never find in-built Bluetooth button since these sticks are made to be waterproof (at least for now). If you happen to have one that comes together with your GoPro camera, then you can use that. Generally, GoPro sticks are more expensive compared to normal ones. So I guess I have laid down the core differences clearly. In this post, I will be focusing solely on GoPro sticks. If this is not the type of selfie stick you are looking for, then I would recommend you to take a look at my other post instead, best selfie stick for normal usage. GoPro Selfie sticks are designed to make your solo adventures memorable by holding your camera device at arm’s length to fit you into the frame. These have made it easy to test your photography skills to new heightsbeit taking shots at boisterous sport activities or friendly hiking and water diving trips. However, before you purchase such an accessory you should look for features that suit your needs. There are six distinct features which will help you to assess whether the product you are buying will meet your expectation: Waterproof, Durability, Mount Capacity, Expendable length, Lifetime Guarantee and Specialty. Check out the table below for quick comparison between the qualities of each different GoPro selfie sticks. This is one of the most essential factors that you should evaluate to decide which selfie stick is right for you. You must have an idea of what model of GoPro you will be attaching to your accessory, so make sure the clamps of the selfie stick are the right size and weight before opting for it. Also, test whether your selfie stick has a strong rubber grip so that it does not slip away from your hand. 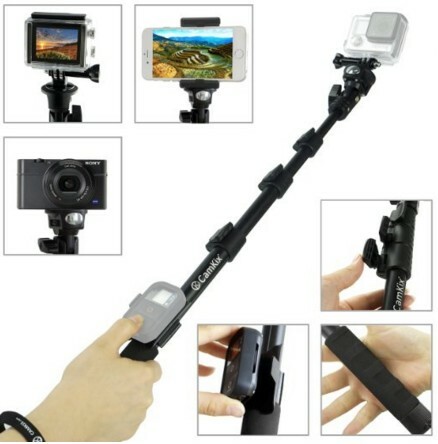 Solid camera handle and adjustable wrist grips will prevent your pictures from blurring. Besides that, check twice that the stick is easily rotatable at will to take quality pictures at wide and diverse angles. Extreme sports lovers and adventurers like to capture moments of their achievement within the frame of their camera. If you are one of them, then you must look for a selfie stick which is as strong as you are. Look for the material it is made up of and whether it is capable to take the rough ride with you. Upgraded and high quality material such as aluminum and steel will make your selfie stick last longer and prevent it from being dysfunctional due to minor falls or scratches. Is your GoPro camera powerful enough to take underwater shots? If yes, then you must have a selfie stick which does not restrict you to any boundaries just like your camera. You will have to look for a selfie stick which is as immune to water as land. Then only you will get the full freedom to use the accessory at your full capacity. You do not want to buy something which you can use only half the time and does not live up to your standard. One of the main aims of buying a selfie stick is to have the flexibility of taking short or long shots whenever necessary.That is why the more extendable the stick, the better it is. An average selfie stick can be a minimum 7 inches short and extendable to up to a long reach of 46 inches. You have to determine the flexibility that best suits you and whether the stick has an efficient locking system at any adjustable length so that you do not a be a victim of wobbly pictures any time you try to fix your stick to a different length. Purchasing a product is always a risk because of its unknown defects or defaults, which may have skipped your mind. To eliminate the risk, it is preferable to buy a product which gives you a guarantee that you can return your product anytime if you find it has some manufacturing defect or need a fix. This not only proves that the product you are buying is reliable but that you will be in good hands at times of your need. Finally the value added features that comes with your selfie stick. You are always at an advantage if you get any extra features that make your selfie stick unique. Some sticks come with a compact mirror or portable carry-on bag. Others come with in-built bluetooth remote or cradles for your cell phones or remotes, which certainly complements the money you spent on it. These specialties will enhance your selfie experience with greater adaptability and accessibility giving you the ultimate satisfaction of purchasing the product. GoRad is the excellent combination of strength and beauty. You will get yourself a rock solid selfie stick to bring on with you at any place you like. Ever have those situations where you want to capture the exotic beauty of nature in your lens but you cannot quite make the angle right? With GoRad’s adjustable pole which can be extended from 17 to 40 inches, this is not impossible anymore. In fact, you can bend or toss and turn as much as you like with the selfie stick in your hand but it will not fall off. The adjustable camera strap with rubber grip will prevent it fromslipping out of your hands. Its twist and lock system along with its solid exterior made of aluminum is made for taking professional and adventurous photos alike with perfect stabilization. This is the “IT” stick if you are a sports fanatic and like taking close ups or POV s shots during those enthralling moments of snowboarding, skiing, surfing, scuba diving, hiking and all such extreme sports. It can survive under both salt and fresh water, so you can also have perfect shots underwater too. GoRad is quite lightweight and comes with a bonus nylon bag making it convenient to carry. Its GoPro compatible tripod which connects to GoPro Hero 4, 3+, 3, 2, & 1 cameramake it highly compatible and a popular buy. What more, you have a lifetime guarantee giving you the confidence to buy without the worry of fixing the manufacturing defects on your own but to just simply enjoy the experience! 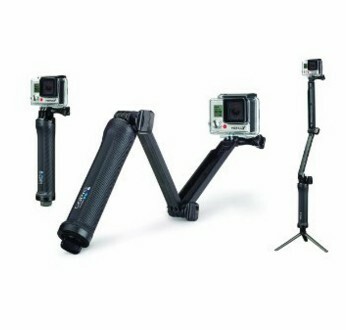 GoPro 3-way is a must buy for the photo enthusiasts who prefer to take photos at wide and versatile angles. As the name suggests, it is much more than a selfie stick as it gives you the liberty to use it in three distinct configurations. You can use it as a tripod or a camera grip or even as an extension arm as necessary enabling you to take excellent crystal clear photos. Capture perfect candid photos up close or use it to take wildlife photography since you can expand it to shorten it at you will from 7.5 inch and extend it at its full capacity till 20 inches. No need to worry about its adaptability as you are looking at a selfie stick which is easily adaptable to all the existing GoPro cameras. Use any GoPro camera you like and use it on land or under water as this accessory is waterproof around or deep in water. You will enjoy using this light and easy to handle stick transforming the handle to camera grip anytime. However, you have to use it with care as it is delicate in nature compared to other sticks in the market. This ultra-versatile product comes at a bit hefty price but it is totally worth the risk if you are up to it. ThrillPro is wildly popular among buyers who are looking for exceptional quality of selfie sticks at a reasonable price. The stick’s durable aluminum constructions make it the perfect companion for passionate adventurers who like to travel at rough places and keen to take exotic raw pictures of nature from above a mountain or the edge of a swinging boat. A fall or little bumps will not be enough to break it down and its 100% guarantee insures you from any manufacturing defaults. You can elongate it to 36 inches making long beautiful shots as you go. It is a perfect fit with tripods and in fact has an extra 1/4x 20 threads on the bottom that can be attached to tripods making it a self-standing monopod! However, its lock system for different angles can slow you down when you try to take pictures at different angles at a fast pace. So, you need to get used to it before taking it along the ride. It does not have any bluetooth shutter or in built battery so you do not have to stress on charging or syncing it. You can easily emerge it under water though be cautious not to let the stick be wet as the screws can then get rusty making the selfie pole unretract able. ThrillPro is universally known for its strong compatibility to any device up to 80 mm be it iPhone, GoPro, DSLR or Camcorders. So, if you purchase it you are winning the most user friendly accessory to make memories with your cameras. CamKix is the best accessory you can imagine for an amazingly low price. It may not be known for its star features but it is certainly lucrative in terms of capacity. The pole has an incredible extendibility to adjust to any size from 16 inches to a whopping 47 inches. Its marvelous clip lock system can extend or retract the pole at ease offering you a huge reach. You may predict that for this type of efficiency, the stick obviously needs to be made with high quality material to take flawless still shots. It makes itself handy to the users by providing cradle for your WiFi remotes and even your cellphones. Another value added features that it comes with is a compact mirror at the peak of the pole presenting you a preview of how your selfie will take shape. You can swivel around to take the perfect position before clicking your camera making it a perfectionist’s favorite for capturing stills. The Premium Telescopic Pole makes itself available to multiple models of GoproSeries, Compact Cameras and Cell Phones. You can attach the compact cameras right away with the pole while for GoPros you can pull it together using the mount and thumbscrew provided. Being cheap has its price though as it is not waterproofed and you do not get the luxury of a lifetime guarantee. However, at half the price of other selfie sticks it is certainly praiseworthy for its distinct features and durability. This High End selfie stick has been awarded as the number one professional selfie stick on Amazon in 2015. So, without dispute you may say that it is quite reputable and comes with some truly attractive features. The accessory is suitable for a professional with a tight budget but that does not mean it looks cheap. The metallic ethnic design makes it look quite posh and it is built with tough material enabling strong rubber grip. The flip lock system with its 49 inch exclusive extendibility is quite impressive on its own. To complete the package, it also offers two interchangeable mounts one with lock stretching to 4.2 inches and another with mirror for your rear HD camera. Another distinct feature that you will absolutely love is its removable bluetooth remote which is easily rechargeable and can tolerate usage for prolonged hours. 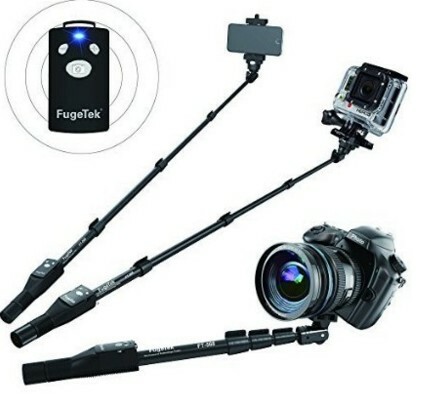 It is recommendable for its highly compatible ability with any Apple, Android, GoPro, & DLSR. Now, you have a selfie stick at your disposal which gives you the power to take stable crystal clear photos making it impossible to figure that it is a selfie picture. Take it with you anywhere with its portable carrying bag and USB cable. Do not search anymore and purchase this highly demandable selfie stick as long as you are happy to take thrilling pictures on land and do not intend to dive into sea to capture the life of the water kingdom. This buying guide will hopefully give you the answer to all your inquisitive questions while hunting for a selfie stick. There is something for everyone disregarding how contrasting your budget or expectation. Make good use of the tips and suggestions given above and choose the one which best cater your needs.